Can You Smell DIRTY SOCKS?? Air Conditioning Servicing is Needed ASAP! We aren’t talking about smelly feet… this stubborn odour smells like gym socks but is actually your air conditioning. As bacteria builds up in your AC system it grows on your coils and starts producing damp, musky smells. Furthermore, the environment in home air conditioning systems are perfect for harbouring mould which is toxic. If you have been enjoying the use of your AC this summer in the unexpected heatwave we hope you haven’t neglected your air conditioning servicing. A rise in technology to heat pumps means systems can easily switch from cooling to the heating cycle. Most modern air conditioning works using a heat pump principle which can reverse the cooling cycle to heating. The often cold and wet environment allows microbes to form and multiply. AC then becomes a little mould haven, the perfect toxic environment. So what about when the system is in heating? Unfortunately the heat generated while in heating mode is not hot enough to destroy the bacteria on the coils. Furthermore, when on heating mode it will omit the odour into the air. Additionally, this transient odour will come and go giving people a false sense of security that there isn’t actually a sinister problem in their home. 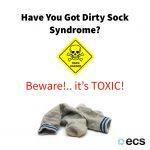 Just as you wash your socks, your system is likely due a clean. Spraying the coils with a chemical coil cleaner, as well a clean/change of the filters will often remove the smell. An air conditioning contractor will often look at other areas while on the service also, such as air off temperature, electrical connections and the system pressure in line with F-Gas regulation. Air conditioning servicing is an important part of maintaining your air conditioning, not just for warranty but additionally for your own health to avoid dirty sock syndrome. Mould and bacteria related illness are extremely prevalent. 60% of all indoor air quality problems and allergies are likely to be mould-related according to WHO (World Health Organisation) statistics. According to their research the toxins and bacteria that can be found in mould are responsible for “serious and sometimes even life-threatening reactions”. If you would like to speak to one of our team and find out more about our Air Conditioning Servicing… click here to get in touch today!